Let’s be honest, we all like spying on other people; some of them even invite you to do so. If you like watching horses (and you must, or you wouldn’t be here, would you?) there are a few horse and barn cams out there for your viewing enjoyment. You may need additional browser plugins in order to see some of these streams, and not all of them work well on Macs, grrrrrrrrrr. AnimalCameras.com brings us the Jimmy Jam cam, broacasting from a horse rescue in Utah. Serenity Training shows a BLM mare and her foal. CEOates Ranch offers videos of their Quarter Horse Paint mares, and foaling videos. You can watch the arena at Haywire Farm in Ohio, or see spots in front of your eyes at Saddlebrook Appaloosas. SevenAcres Farm has minis for your viewing enjoyment, and there’s another good cam at Bestovall Arabians. While we’re on the subject, you can also get disposable cameras with horse designs! They’d be great for 4-H, Pony Club, or as prizes or promotional giveaways at any horse event, and part of each purchase goes to help the North Shore Animal League. Google has now made many out-of-copyright books available online. Some links to get you started: Appaloosa, Arabian, Black Beauty, Breyer Horse, Broodmares, Colic, Cowgirls, Draft Horses, Dressage, Equestrian, Equine, Equine Psychology, Farrier, Foal, Hackamore, Hoof, Horseback Riding, Horsemanship, Horses, Horse Racing, Horse Show, Miniature Horse, Morgans, Mules, Natural Horsemanship, Ponies, Quarter Horses, Rodeo, Saddle, Snaffle, Sport Horse, Standardbred, Thorougbred, Veterinarian, Welsh Cob, Wild Horses, Zebras. What treasures have you found? My favourite thus far is Conquerors: The Roots of New World Horsemanship by Deb Bennett. BlogDay was created with the belief that bloggers should have one day dedicated to getting to know bloggers from other countries and areas of interest. On this day every blogger will post a recommendation of 5 new blogs. In this way, all Blog web surfers will find themselves leaping around and discovering new, previously unknown blogs. Just to be different, here are some non-horsey blogs I love…had a hard time narrowing it down to just five! I love ephemera, and Swapatorium serves up mysterious old photos, junkyard treasures, weird old crafts and lots of other neat things. All the latest Fortean happenings. It’s like a brilliant mashup of MST3K, Ebert & Roeper, and some drunken graduate history students (which I used to be–well, not so much the “drunken” part). Great potpourri of all things neat, cool, useful and interesting. Honourable mentions: DogBlog, Pop Culture Junk Mail, I Wanna Be A Supermodel, High Strangeness, Strange New Products. Let us all hail BarnGoddess for her post, which is how I found out about BlogDay. Others are much more recent; the Alton Barnes horse, above, was commissioned by a man named Robert Pile in 1812, while the Westbury horse, also in Wiltshire, is thought to be much older, as it was mentioned in an 18thc. book. 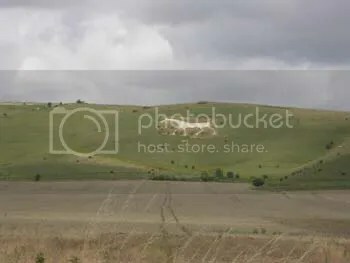 Exiled Preacher and Wiltshire Hotpot have some great photos. 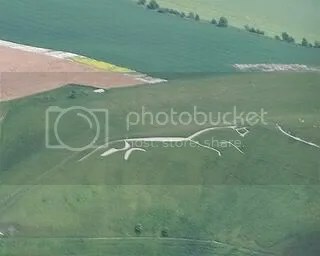 Most of the figures were created by scraping away the top layers of grass and soil to expose the stark white chalk underneath, and the ones we know of only survived due to the maintenance efforts of local people, who scraped the figures clean and removed any vegetation which began to grow on them. However, some were constructed by piling light-coloured stones or rubble together to create a shape. According to Wikipedia, “Ancient figures all have an associated fair or ceremony which involves maintaining them.” Not all have survived; many of the older ones were lost and overgrown, like the Rockley horse (below). Matthew Broderick just broke his collarbone while riding a horse. This makes Broderick the fourth or fifth person I have heard of in recent months who was injured while riding a horse. This got me to thinking: how dangerous is horseback riding, especially as compared to, say, riding a motorcycle? Read the rest at Freakonomics. 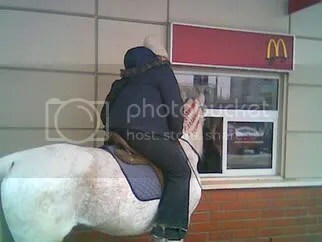 Another great horse-at-the-drive-through photo, found here.